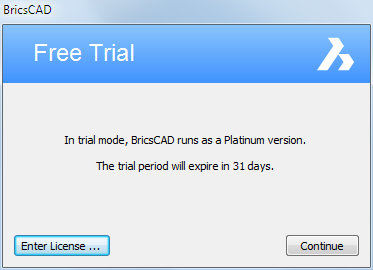 BricsCAD can run in trial mode for a 30 days period. After this period, a valid commercial license needs to be activated. If your computer is not connected to the Internet, activation can be done manually via another computer (which is connected to the Internet). See Activate a trial manually. 1. Launch the BricsCAD executable, e.g. double click the BricsCAD desktop icon. 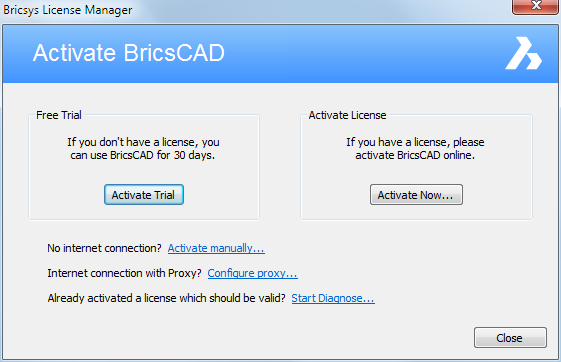 The Bricsys License Manager - Activate BricsCAD dialog opens. 2. If your computer connects to the Internet through a proxy server, click the Configure proxy... link to configure the proxy settings. 3. Click the Activate Trial button. Each time you start BricsCAD in trial mode the BricsCAD - Free Trial dialog opens. Click the Continue button to open BricsCAD in trial mode. Click the Enter License... button to activate a Single or Volume license, or to use a Network license. In trial mode BricsCAD runs as full Platinum version without any feature restrictions. The RunAsLevel preference setting allows to run BricsCAD in a lower license level mode, e.g. a Platinum version can be run as a Pro or a Classic, a Pro can be run as a Classic. This facilitates evaluation of the features available for each license level. In BricsCAD, in the Settings dialog box, go to the RunAsLevel preference or, on the command line, type "RunAsLevel". Enter the value for the level you want to try: 0 = Classic, 1 = Pro, 2 = Platinum (default). Restart BricsCAD to apply the changes.